The Strangest Ever DOCTOR WHO Merchandise | Warped Factor - Words in the Key of Geek. When I was a kid in the 1970s I was crazy for Doctor Who. I had some books and annuals, a record of Genesis Of The Daleks, some stationary and a lunchbox, I also had a pretty cool talking K9. That was quite a hefty collection for the time. Nowadays of course we are spoiled for choice when it comes to Who memorabilia, kids think nothing of seeing Doctor Who birthday cakes, Matt Smith action figures or David Tennant life size cardboard cutouts. But over the years there has been some very strange merchandise available, so we've gathered up some of the weirdest Doctor Who items that have appeared on the shelves in the last 50 years. How many of these did you have? 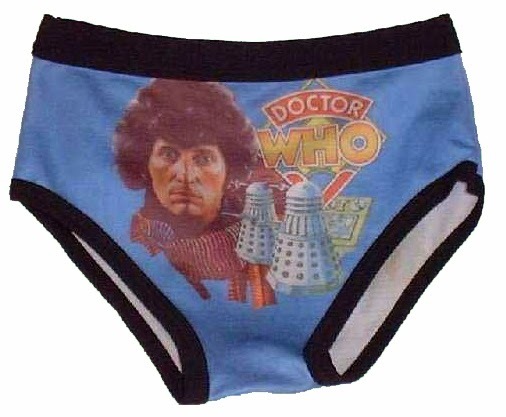 I don't think any child would've wanted to wear these, no matter how much they loved Doctor Who. Look at the size of them, Tom's hair would be sticking out the waistband of your trousers. Plus could you imagine getting changed for P.E. and stripping down to your Tom Baker pants? Oh, the bullying that would ensue. Mind you, you could always claim that it's bigger on the inside!!! This is one that's available today. 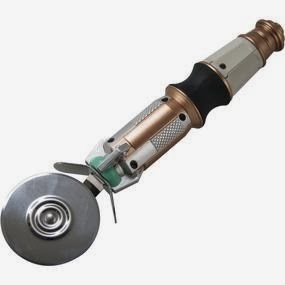 Of all the uses I could think of for a novelty Sonic Screwdriver I don't think I'd ever have thought Pizza Cutter! But if you fancy one then you could buy this for those times when you're really, really struggling to cut up an over-microwaved Chicago Town pizza and only Time Lord technology will do. Not only that, it talks! Happy Christmas Billy, here's your present. It's a box. An almost empty box. I think there's a case to be made for misleading advertising here. How on Earth is this poseable? I would image you'd have to be the most die-hard of Doctor Who completest to own this. But if you do want one, we just checked and Amazon have them. But hurry, at 50p they won't last! Ladies and Gentlemen, it's the Pat in the Hat! I know this came out in the 60s but let's also remember that we put a man on the moon in the same decade! The Berwick Dalek Playsuit was essentially the bottom of a dustbin attached to the centre of laundry basket with a red dustbin liner glued to it. You held on to the gun and sink plunger and ran around shouting "Exterminate!!!" Actually, that does sound pretty cool. Unfortunately, they now sell for a fortune on eBay. Oh well, back to my talking K9!